The seventh State of the University address by Charles R. Drew University of Medicine and Science (CDU) President/CEO David M. Carlisle, MD, PhD, featured notable examples of growth by the health professions education institution over the last 12 months, and culminated in a groundbreaking for a new grand entrance and student center. The October 9 address detailed such high points as the return of Graduate Medical Education to CDU, two new degrees offered in Fall 2018 (MS-Psychiatric Mental Health Nurse Practitioner and BS-Nutrition Science and Food Systems) and the renewal of the University’s accreditation for 10 years by the WASC Senior College and University Commission. Since Dr. Carlisle assumed his post in 2011, the University has seen steady progress, achieving this year their highest enrollment rate ever—over 700 students as of September 2018—and reporting over $5.1 million in philanthropic gifts and an endowment of $95 million. Dr. Carlisle’s said that that though the University had experienced adversity throughout its history, those trials enabled it “[to become] stronger and, for the first time in a long time, we’re able to plan for a future that [seems] certain.” He emphasized that though CDU has made much progress in the last decade, it was essential to not become complacent. “Academically, financially and physically, this university must once again push the boundaries of what others—and what we ourselves—believe to be possible,” Dr. Carlisle said. 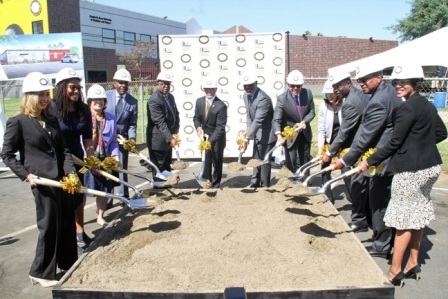 Immediately following the speech, members of the CDU Board of Trustees, the Executive Management Team, along with State Senator Steven Bradford (D-35) and LA County Second District Supervisor Mark Ridley-Thomas, officially broke ground on the site that will serve as the University’s grand entrance as well as a dedicated student services facility. Both projects are expected to be completed by the end of Spring 2019. For more information, follow visit http://www.cdrewu.edu/, and follow CDU on Facebook, Twitter (@cdrewu) and Instagram (@charlesrdrewu).